Full references to recent legislation. Clear definitions of terminology related to the spectrum of legal studies, including Latin terms. 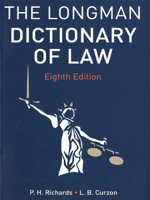 Extensive cross-referencing to all cases and statutes, including law report abbreviations.